Click here for all the picture of the event! 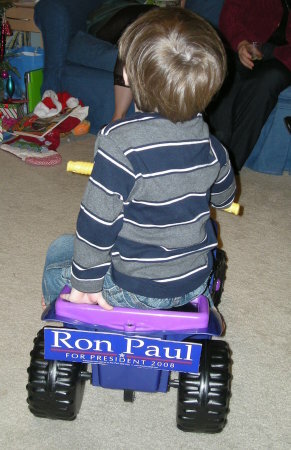 His Quad with a Ron Paul Bumper Sticker. I Am Not Afraid Of Terrorism!!! Nearly 800,000 people have died in car accidents in the last twenty years. During that time there have been exactly two Islamic terrorist attacks on U.S. soil, with less than 3,000 total fatalities. That’s more than 200 TIMES as many Americans dying in their cars as at the hands of Islamic terrorism. And yet . . .We’ve turned the whole world upside down in response to the two terrorist attacks. We’ve launched invasions, created vast new bureaucracies, shredded the Bill of Rights, compounded regulations, spent hundreds of billions of dollars, and disrupted travel and commerce. But no one is suggesting that we do 200 times as much to address the driving risk, which is 200 times greater. Mike Huckabee’s Jacksonville Meetup Group is afraid of me? I went to Mike Huckabee’s Jacksonville to see what was going on in the Jacksonville area with Huckabee. They didn’t have their calendar viewable to the public, so I tried to join the group. I got the following response from a leader of the group. elected. I see that you are a member of a Ron Paul meetup. Apparently they are afraid of what I may learn about them. Personally I can’t imagine what they are trying to hide. I have has some issues with trackback/ping spam with WordPress. 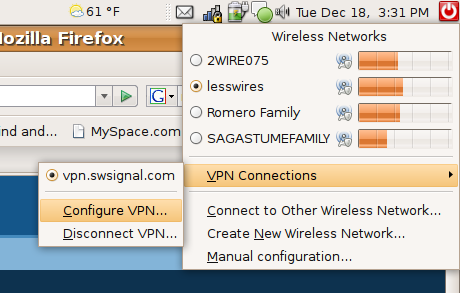 I already have turned off the “Allow Pings” option, but this does not retroactively fix previous posts. To update my previous posts, I used the following SQL command. 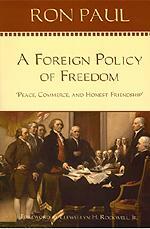 I recently finished Ron Paul’s Book “A Foreign Policy of Freedom: Peace, Commerce, and Honest Friendship” today. It is an interesting collection of Ron Paul’s Speeches in Congress and various diary entries. I can honestly say that this book changed the way I look at the world and US foreign policy. We should restore the Constitution as the foundation for all Congressional and Executive policies, budgets, and decisions. The importance of having a currency backed by real wealth, not the fabricated wealth used by the banks to enrich themselves at our expense. Disappointments with this book. Yes there are a couple.